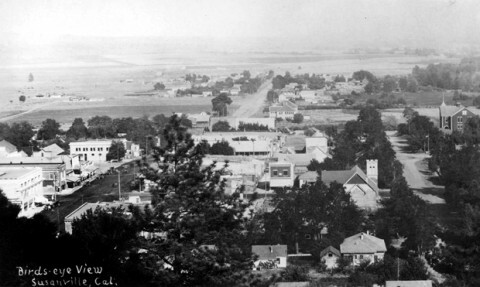 Susanville in the early 1930’s from Inspiration Point. Halloween held no terrors for property owners in Susanville when a gala parade and a free show for youngsters of the town took up the would be mischief makers time and interest until a late hour. The parade was made up of some 400 children, all gaily bedecked in every sort of costume from witches to pirates. After frolicking about on the main street for three-quarters of an hour the gay troupe attended a performance at the local theater. Jules Lindner high ranking California distance runner led the parade while a brass band kept young feet skipping. The streets were lined with admiring parents and red flares went to create a carnival spirit throughout the crowd. By the time the show was out it was a lusty but tired younger generation which proceeded quietly homeward and Susanville slept with a peace of mind which it had not enjoyed before in a month of Halloween nights.